Some sources assert that this engagement happened on August 19th. The battle of Musgrove's Mill was one of the many obscure engagements for which accurate records pertaining to the fight are rare. But it was nevertheless a brilliant victory for the Americans. It came just two days after the terrible Patriot's loss at Camden and the same day (or day after) as the loss at Fishing Creek. Still, those who fought at Musgrove's Mill were not inspired nor discouraged by the situation because, communications being what they were in those days, the combatants at Musgrove's Mill most likely didn't even know about Major General Horatio Gates's defeat at Camden or Col. Thomas Sumter's defeat at Fishing Creek (new sources hint that perhaps they did learn just prior to or immediately after this event). 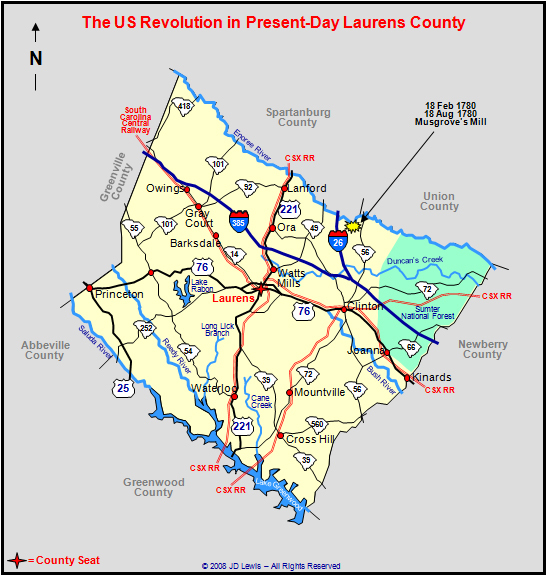 The battle of Musgrove Mills took place in what is now Spartanburg County and Laurens County on August 18, 1780, two days after the battle of Camden. The Patriot forces were led by Col. Isaac Shelby (NC), and much like the Patriot's military organizational structure at the battle of Kings Mountain later, Col. Shelby's forces were made up of several smaller units with individual commanders. They probably totaled no more than 250, although some estimates hint at as many as 750. They planned to attack and disperse a band of Loyalists of similar size (though some records say much larger) at Musgrove's Mill, on the Enoree River, but when they got there, they found that the Loyalists had been reinforced with about 100 extra men who were better trained and equipped than the first 200. These men, though better soldiers and attired in redcoats, were apparently not British regulars, but actually were Provincials led by Lt. Col. Alexander Innis. They were recruited and trained in this country. And we hasten to point out, after Brigadier General Daniel Morgan and Major General Nathanael Greene finished mauling them later, they were going to need to recruit a lot more in early 1781. 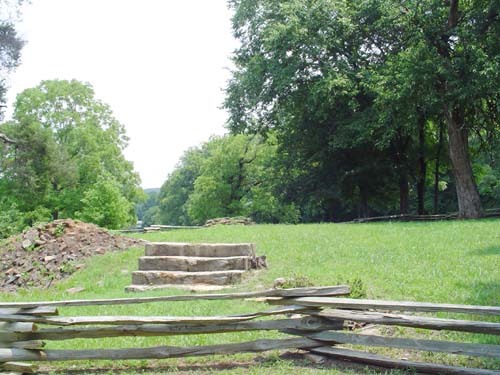 Col. Isaac Shelby decided to try to lure the Loyalists into attacking him at a prepared defensive position. Unfortunately, Col. Shelby lost the element of surprise when he was discovered and engaged in a brief skirmish. At that point, Col. Shelby and his main force fell back a short distance and created a defensive line within sight of the Loyalist force. Other Patriot units were led by Col. Elijah Clarke of Georgia and Col. James Williams of South Carolina. These Patriots were successful in goading the Loyalists into an attack. After a fierce back and forth exchange, Lt. Col. Alexander Innis was shot from his horse and the redcoated provincial troops began to fall back. This caused the other less seasoned Loyalists to waver and allowed the Patriots to retake the initiative. It became a rout and only ended when the fleeing Loyalists reached and crossed the Enoree River into what is now Spartanburg County. At that point, news of Major General Horatio Gates's defeat at Camden arrived along with the fact that British Major Patrick Furguson was nearby. The Patriots quickly decided to retreat with their prisoners and reportedly missed being caught by Major Furguson by less than thirty minutes. The Patriots suffered four killed and nine wounded, while the enemy had 63 killed, 90 wounded and 76 captured. It was a decisive win and one of the few times Patriot militia defeated British-trained professionals. - Capt. Valentine Sevier, Jr.
- Capt. Robert Gillam, Jr.
- Capt. John Ridgeway, Sr.